As a 13 year old boy, Jason knew he was called to be a pastor. 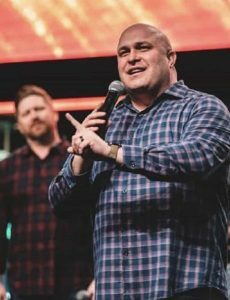 But his journey to lead Vibrant Church started with Jason serving our country in the United States Marine Corps., then attending seminary and training under one of the country’s most respected pastors, Pastor Tommy Barnett. Pastor Jason met his beautiful wife, Rachael, while serving in ministry in Phoenix. They have spent over a decade in ministry together and have been blessed with three amazing kids: Ava, Nathan, and Trace. Pastor Jason holds a BA in Religious Studies and a ThM (Masters of Theology).